The cause of macrocytosis can be elucidated by the shape of the red cell (round vs oval), determining if megaloblastic vs non-megaloblastic, and patient history. Common causes of macrocytosis are alcohol abuse, liver disease, folate deficiency, B12 deficiency, and myelodysplasia. The initial workup for macrocytosis includes a peripheral smear, a reticulocyte count, folate/B12 assessment, and a TSH. Most cases of folate deficiency are due to lack of intake. Most B12 deficiency is due to poor absorption. When a patient has macrocytosis (MCV>100), findings on the peripheral blood smear can help differentiate amongst the potential causes. The shape of the macrocytic red cell can be a clue. A round cell suggests alcohol abuse or liver disease. Oval-shaped cells are seen in DNA defects, B12 or folate deficiency, myelodysplasia, and chemotherapy. The presence of megaloblastic versus non-megaloblastic cells is helpful. Megaloblasts are large, structurally abnormal, immature cells. They represent a problem with DNA synthesis. Oval macrocytes (a.k.a macroovalocytes) are seen in megaloblastic scenarios, as are hypersegmented neutrophils. Myelodysplasia, chemotherapy, B12 and folate deficiency cause this. Non-megaloblastic macrocytosis has round macrocytes and is seen with liver disease and alcohol use. Benign macrocytosis may be the cause when the work-up is entirely negative. These patients may have a subtle membrane defect. Since reticulocytes have an MCV of 160, reticulocytosis is associated with macrocytosis. Though rare, thyroid disease is in the differential diagnosis of macrocytosis. Most folate deficiency is due to lack of intake. Natural sources of folate include green, leafy vegetables such as spinach. Unfortunately, the natural sources are poorly absorbed (pill form can be better). Bread, wine and beer are fortified with folate. Malabsorption, pregnancy, and hemolytic anemia can cause folate deficiency. Alcohol abuse can result in folate deficiency due to poor food intake, direct toxicity and the inhibition of folate metabolism. Diagnosing folate deficiency can be difficult, as folate levels are very unreliable. Homocysteine levels are a better marker for deficiency. Folate levels and red cell folate levels correlate poorly with tissue stores. Folate is required to convert homocysteine into methionine. Therefore, folate deficiency is associated with high homocysteine levels. Most B12 deficiency is due to an absorption issue. B12 usually comes from an animal source. It is produced by bacteria and is found in meat and milk. Absorption of B12 is very complex and requires transfer and release from several binding proteins. Stomach acid is needed to dissolve food and release B12. No stomach acid = no dissolved B12 . Dissolved B12 binds to a protein in the stomach called R-protein. This protein protects B12 from degradation by stomach acid. Pancreatic proteases dissolve the R-protein in the duodenum, releasing B12 which then binds to intrinsic factor. Intrinsic factor, which comes from parietal cells of the stomach, must bind to B12 in order for it to be absorbed by enterocytes in the terminal ileum of the small intestine. B12 absorption can be impaired if there is a defect in any of the steps involved in the above complex process. This can occur following gastrectomy, bariatric surgery, pancreatic disease, tapeworms, terminal ileitis/Crohn’s disease, or with the use of proton pump inhibitors or H2 blockers. True pernicious anemia is an autoimmune destruction of the parietal cells and is relatively rare. Formerly the Schillings test was used to diagnose this, though today it is detected by ordering antiparietal cell and intrinsic factor antibodies. Measuring B12 levels is complex and controversial. DeLoughery only uses the methylmalonic acid level (MMA) as a gauge of B12 deficiency. When a B12 level is ordered, the technicians measure B12 which is bound to a protein called transcobalamin. 90% of the transcobalamin is transcobalamin I (the remainder is transcobalamin II). Transcobalamin I is influenced by other things. Estrogen makes it go down. Inflammation makes it go up. Serum vitamin B12 levels do not accurately reflect tissue B12 levels. Methylmalonic acid (MMA) is a more sensitive measure of B12 deficiency than the B12 level itself. B12 turns methylmalonic acid into succinyl-CoA. Vitamin B12 deficiency is associated with elevated MMA levels. There are occasional technical difficulties with the kits used to measure B12. MMA, on the other hand, is directly measured using mass spectrometry and tends to be more accurate. MMA is sensitive but not specific for B12 deficiency. The elderly, for instance, can have high MMA levels without B12 deficiency. MMA levels can also be falsely elevated with estrogen use, pregnancy, inflammation, and renal disease. The upper limit of normal MMA level is 0.4 µmol/L (4.7 µgrams/dL). Causes include ingestion of excess zinc or malabsorption. Some cases are idiopathic. 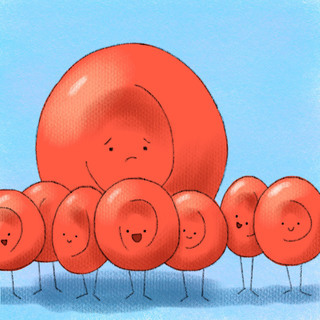 It is associated with anemia, neutropenia, a normal platelet count, and neurologic symptoms (such as ataxia). Laboratory confirmation is with a copper level. Oral copper supplementation is the treatment of choice. When is a bone marrow biopsy indicated?